Because the truth is that I am not really a very good organizer. Certainly not an expert! Oh I may have found some clever ways to organize my small kitchen to make it more functional and share some ways to organize crafts by zones. But at the heart of it, I'm not an organizer, I'm a creator. I like to make things pretty. And while it could be argued that an organized closet or drawer or pantry is a thing of beauty....it's not really my favorite thing to do or blog about! I'll still be purging and organizing in my home this year. But it won't be the stuff of legends! And I don't think it belongs in my post today. Creating beauty brings me JOY! So I've shifted gears and am sharing a little project with you today. We've lived in a lot of places! Two countries, 7 homes and 4 states! My kids were each born in different states, and one in Canada. That's a lot of homes! Our journey....is part of our journey, know what I mean? It's important for my kids to visually see that journey, so we don't forget where we've been. This project is similar to my personalized custom subway sign, which also shows where we've been (and is a great reminder of the streets we've lived on). So I drew a large US map on my biggest chalkboard that I created (with a lot of help from Google maps)...darn those difficult North Eastern States! Affiliate links are included for your convenience; you'll find my full disclosure policy here. 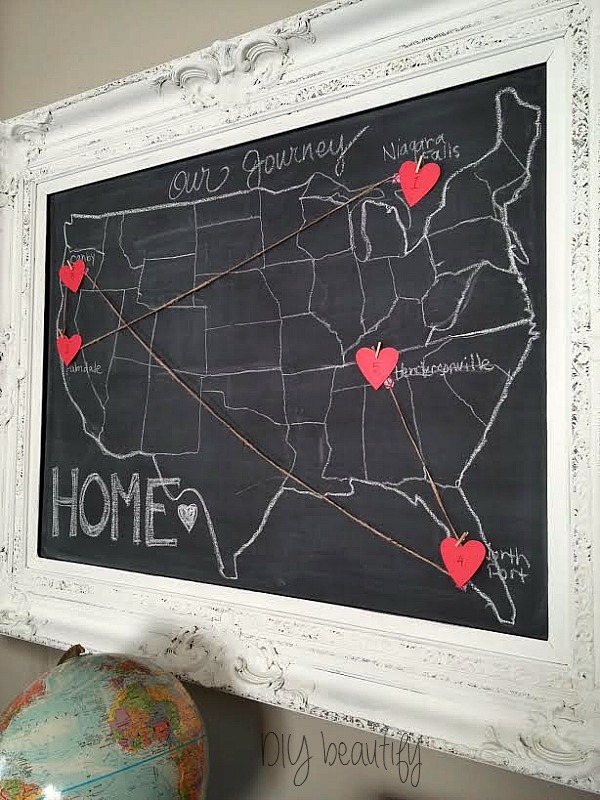 I hand cut a few red card stock hearts, and then started creating our journey. 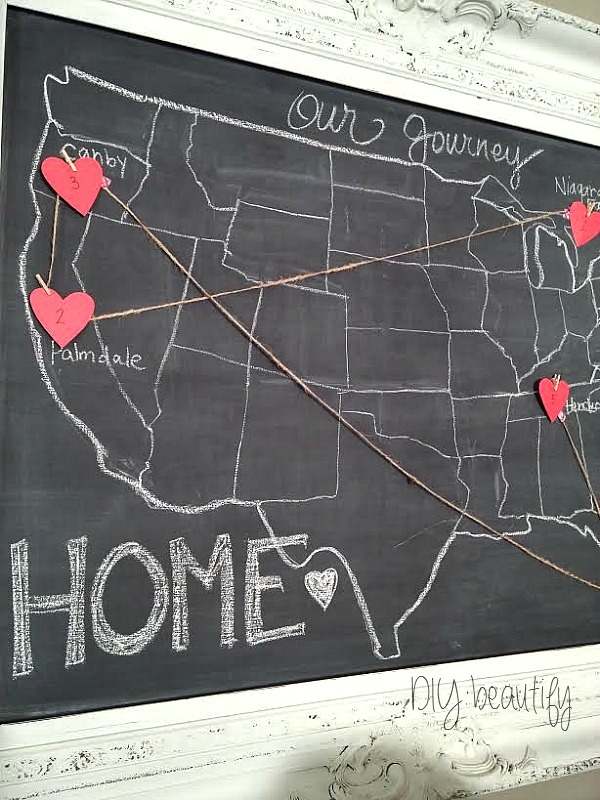 I used simple jute rope tacked down with washi tape to trace the lines to the places we've lived. I then attached the numbered hearts using mini clothespins. 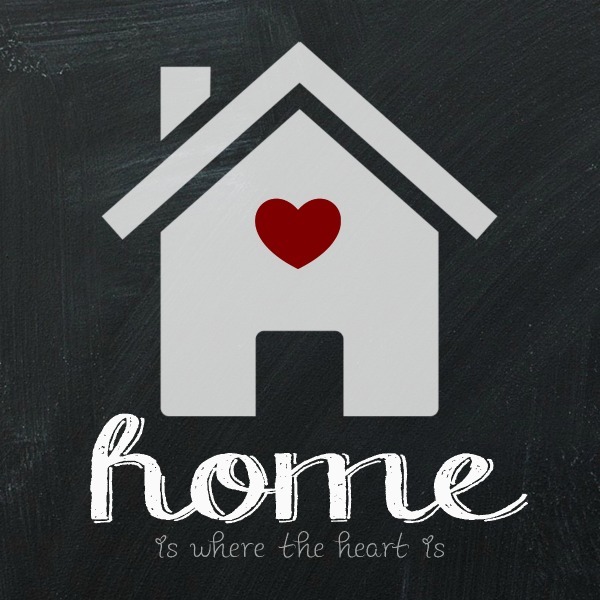 All these places and homes we've lived in...they're all part of our journey as a family. 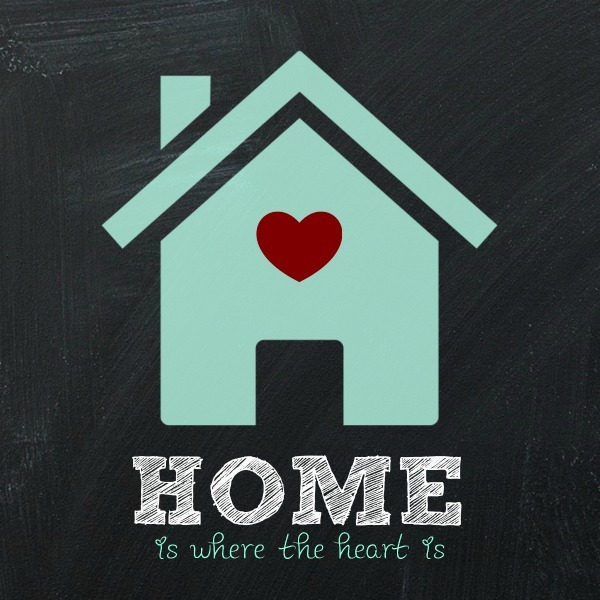 You may have lived in the same home your whole life or you may be like me and home has been so many different places. 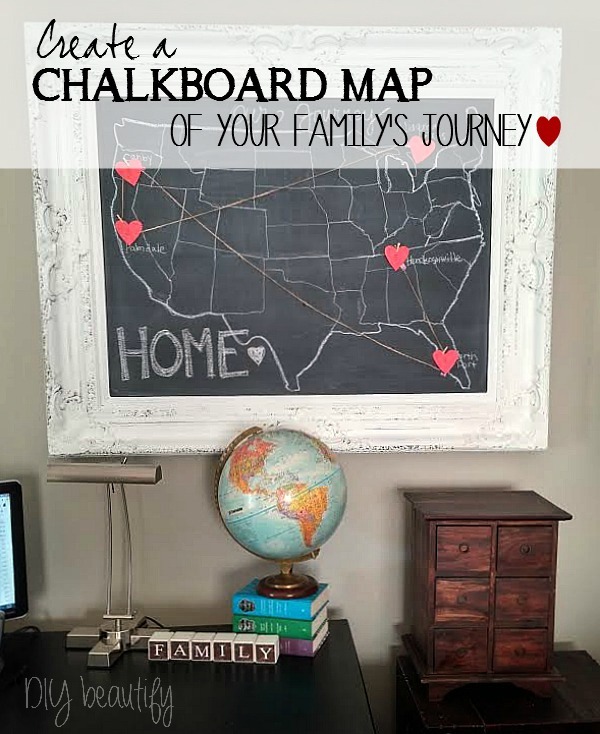 Why not create the memory of that journey on a chalkboard. The hearts are perfect for transitioning into Valentines Day with your decor. The printables on this page are free for your personal use only. You can print them out onto cardstock and pop them into a frame. You can get the mint home printable here and the white one here. 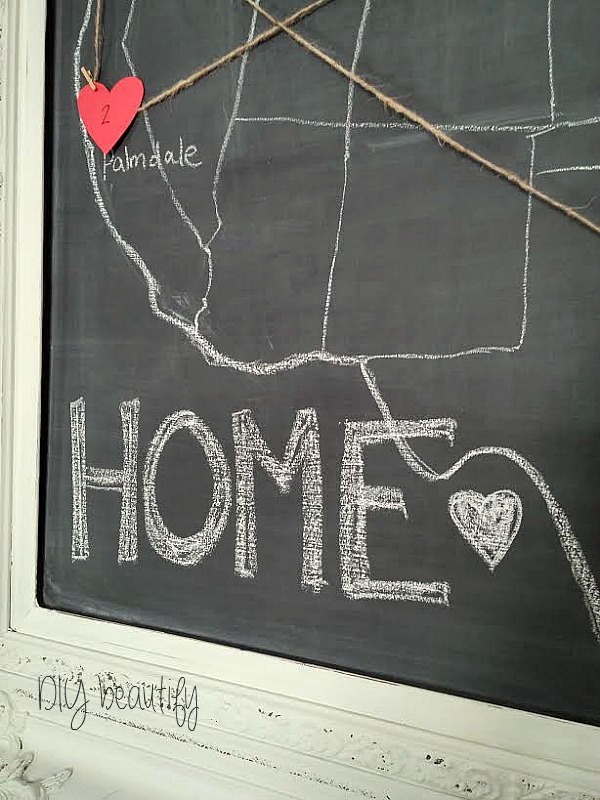 Why not create your own 'journey' in chalk...and spend a little time reminiscing where you've been as a family. It might open your eyes to see a little bit of the bigger picture...and even though you may have bumps and valleys along the way (I know we have those in our journey), it's a great way to look back and remember how you've grown....and how far you've come as a family! I hope you're enduring the (often) dreary month of January! We've had colder than normal temperatures here in middle TN....so I'm planning some colorful and fun projects to keep our spirits up...next week I'll be sharing some pallet signs as well as a yarn craft. What a darling and clever idea Cindy. I love it! Love what you did and seeing as we have had similar journeys with many moves, I have to make this for my family. Thank you for the inspiration! Maybe we will get to hang out together again at the Country Living fair in your "backyard"! Take care! Oh my! This makes me wish we moved around more. Ok, so maybe not, but still love this beautiful and sentimental piece of art! Aw thanks Ginger, I too live the sentiment of it.... moving around a lot has not always (or ever, really) been easy. These types of projects help me feel grounded...to see that I do have roots... they're just a lot longer and spread out than a lot of people's! So cute Cindy! I lived in Palmdale too! Thank you Christine, always thrilled to welcome a new follower! Sooooo cute. I love it. There are some states in the middle that I mix up, too. I just love this idea! I'll be featuring your project at The Scoop this coming Monday night. Thank you for linking up! How awesome is this?! My husband and I have a bit of gypsy in our blood and have bounced around, too. This would be an awesome addition to our home. Thanks for rocking the inspiration! You make the coolest projects Cindy! This is awesome! I am loving this! 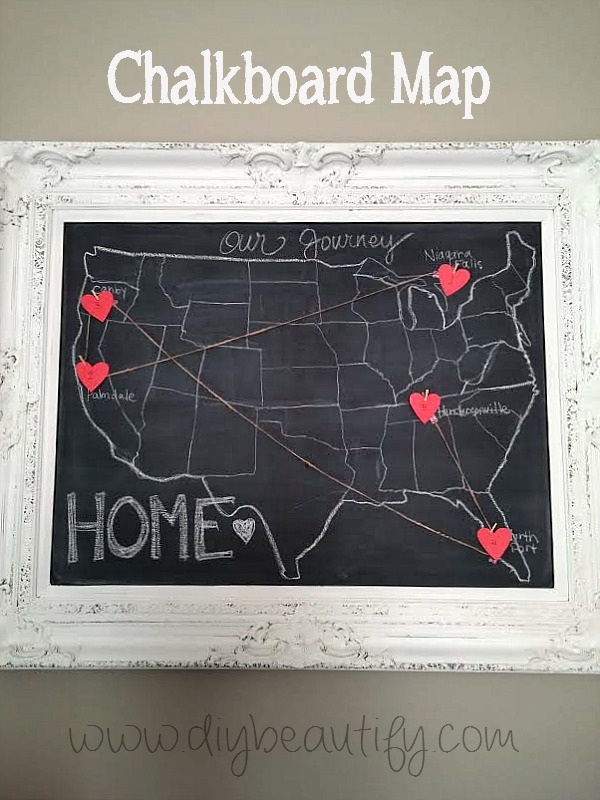 As a retired military family I would love to try this, of course I would have to include Alaska & Hawaii and there would be strings zig zagging all over. I am pinning this...another thing on my to-do list. Wow Tina, and I thought I'd moved around a bunch! You should make a custom subway sign with all the places you've lived. Here is one that I did for my home. You might need a longer board though, haha! That's so cute! My husband and I both LOVE maps. We even put a few on our wedding registry. ;) We have three wall maps with foam backs in our living room, and we use color-coded pins to indicate where we've visited and where we've traveled, individually or together. Right now I'm the only one with pins in Europe, but I can't wait to finally take him to France next year! I love this, it turned out so cute! I'm not a big organizer either so I know what you mean. I like to put things in baskets and that's the extent of it. 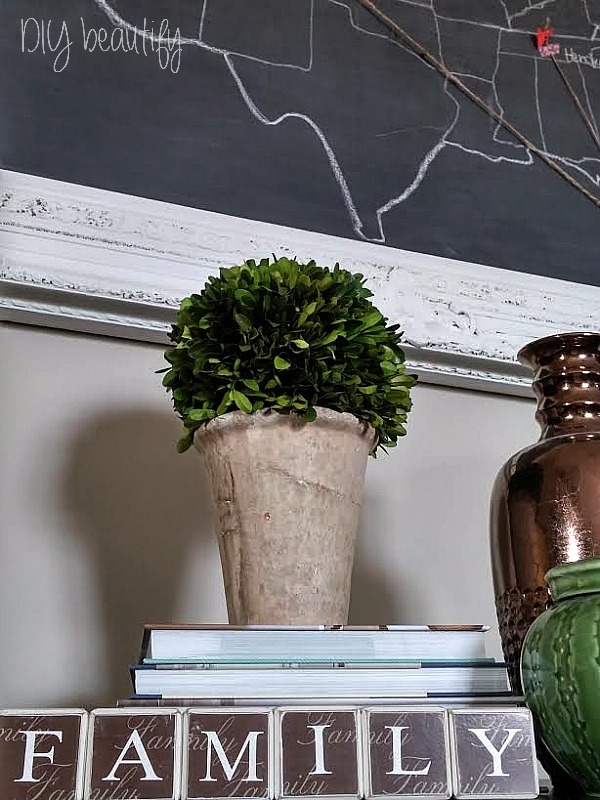 Such a beautiful project you've created, the chalkboard alone is great. Saw you on FNF.